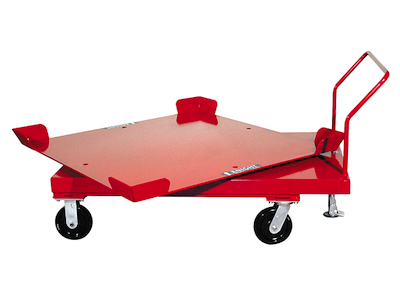 Knight Carts can be integrated with our Lift Tables in order to make loading and unloading easier for the operator. This reduces time lost to personnel injuries and helps increase productivity. 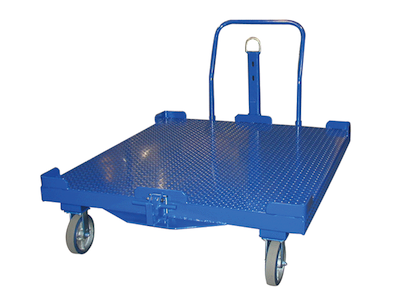 Our carts can be designed to fit a multitude of applications. They are inspected and tested before they leave our facility. Allows you to link and tow multiple carts together for an efficient workplace. Brake system automatically disengages when the tongue of the cart is lowered. 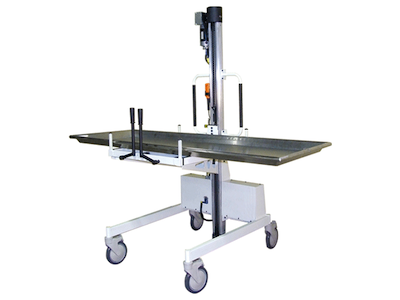 Integrates with Knight Lift Tables. Tongue Locks in “Up” Position. Rotates products for easy access for the operator. Max. Capacity: Up to 1,500 lbs. [680kg]. Pneumatic or Electric power controls for hydraulics. Easily transferred from ambulances, refrigerators, etc. to the desired destination by raising/ lowering the roller bed platform (locking handles ensures the tray is secure while in transit). Has Adjustable limits that are used to set specific up/ down positions as determined by the operator. Standard or Custom built to customer specifications. (2) Two Maintenance Free 12 Volt Batteries. Built-In Charger (plugs into 110v outlet). Wheels may be locked out individually to park cart. Max. Capacity: Up to 400 lbs. [181kg]. Legs(Standard, Low Profile, or Custom). Redundant chain design for safe operation. Two buckets to keep chains separated. Lift Speed: 5 in. [127mm] to 6 in. [152mm] ips at 275 lbs. [125kg].